A stress echocardiogram, often referred to as a “stress echo”, is the combination of an exercise stress test and an echocardiogram. Your physician will usually order it if you have experienced chest pain, shortness of breath, dizziness, or palpitations. Your cardiologist can evaluate the presence or absence of coronary artery disease with this combination of exercise and imaging. Do not eat or drink caffeinated products (coffee, tea, soda, or chocolate) for 24 hours prior to your test. Do not take medications called beta blockers for 24 hours prior to your test. Do not eat anything for 4 hours prior to your test. Wear a two-piece outfit (no dresses), and a gown will be provided. The ultrasound transducer (a hand-held wand) with gel on the end will be moved across your chest in order to acquire resting images of your heart. The first part of the test you will lay on your left side with your arm resting on the pillow by your head. You may be asked to hold your breath at times during this part of the exam. 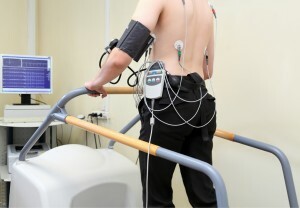 The second part of the test is the exercise tolerance test (ETT) or “stress” test. During this portion of the test electrodes (small stickers) will be placed on your chest to monitor your heart’s electrical activity. Men may have portions of their chest shaved. The stress test measures some aspects of your heart’s performance during physical activity. The treadmill starts at a slow pace and gradually increases in speed and incline as the test continues. You will continue on the treadmill until you have reached your target heart rate. The nurse may stop the test at any time for medical reasons including if you are experiencing fatigue, shortness of breath, or chest pain. Your heart rate and blood pressure are monitored during and after the test. You may ask to stop the test at any time because of significant fatigue or discomfort. However, we strongly suggest that you exercise as long as possible so that we may evaluate your heart under maximum stress. When you have reached your target heart rate, you will be asked to immediately lie down on your left side with your left arm under your head. The technologist will quickly use the transducer to record the stress portion of the echocardiogram images. You may be asked to exhale and hold it for as long as you can during this part of the test. The technologist will record and store both the rest and stress echocardiogram images. You will continue to be monitored until your heart rate and blood pressure return to normal. The entire cardiovascular stress test will take approximately 1 1/2 hours.